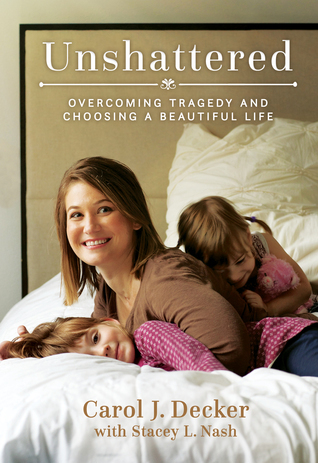 Unshattered: Choosing a Beautiful Life after Unspeakable Tragedy recounts Carol's fight for survival against sepsis and its life-shattering complications. From excruciating skin grafts to learning how to function in daily life without lower legs, a left hand, and her sight, Carol takes us on a personal and raw, yet inspiring journey. She travels through the darkness of trauma, anxiety, and depression to arrive, literally, at the peak of a mountain with a heart full of gratitude and love. More than a story of triumph over tragedy, the book offers inspiring life-lessons and insights which can help readers to do more than endure unimaginable pain and darkness in their own lives. This book can give them the perspective and strength to pick up the pieces of their own tragedies and choose a life of healing, purpose, and joy--a beautiful life. Occasionally I love to pick up books about real people who have endured intense hardships and persevered, overcome. It's always amazing to me how resilient the human spirit can be. Reading books like this one restores my faith in humanity. There really are so many good people out there, working hard to help other people and extending kindness in times of trouble. Mostly it helps me put life back into perspective and remember the things that are most important. I never want to take the good things and blessings in my life for granted. Obviously, Carol Decker is a miracle. She survived something few people do. I am in awe of her persistence and how she has transformed something horrible into something beautiful. Now she shares what she has learned with others and many lives are blessed by her courage and determination. I am glad I picked this book up. I feel better for reading it and that's one of the great things about books. They fill so many different roles in life. Sometimes I read to escape and be entertained, sometimes I read to learn something new. Sometimes I read to be inspired by the triumphs of other people and I always read with the hopes of being a better person when I'm done. Mission accomplished here. Unforgettable Love $100 Kick-Off Giveaway!